Ken Paulson, dean of the College of Media and Entertainment. Tickets are $10 per person and are available here. This “Who Knew” session is focusing on industry leaders who’ve had a fundamental impact on the way products are created and distributed, whether music, platform or device. “It’s the perfect platform to collaborate with an innovative and pioneering institution like MTSU’s College of Media and Entertainment,” he added. 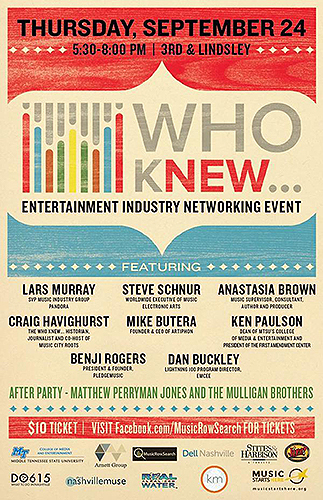 You can learn more about the “Who Knew” event at http://facebook.com/MusicRowSearch. For more information about MTSU’s College of Media and Entertainment and its departments and majors, visit www.mtsu.edu/media.